Description: Clover Valley Lumber Company backing up to prepare for a photo runby during the 2013 Winterail Photographer's Special while a railfan lounges in the grass. This was her first run for the general public after a 6 year restoration. Description: Clover Valley Lumber Company 4 performing a runby for the 2013 Winterail Photographers Special. 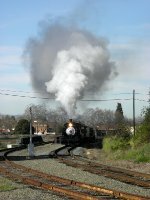 This was her first run for the general public after a six year restoration. Description: Clover Valley Lumber Company 4 shows off during a photo runby for the 2013 Winterail Photographer's Special. This was her first run for the general public after a 6 year restoration. 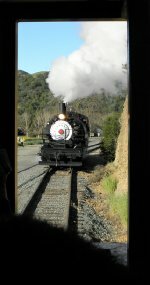 Description: Clover Valley Lumber Company 4 arrives in Sunol on her first run for the general public after 6 year restoration, with the 2013 Winterail Photographer's Special train in tow. 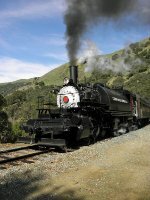 Description: Clover Valley Lumber Company 4 arrives in Sunol on her first run for the general public after 6 year restoration, with the 2013 Winterail Photographer's Special. Note the shadows of the rail fans all lined up with their cameras. Description: Clover Valley Lumber Company 4 backing up to prepare for another photo runby for the 2013 Winterail Photographers Special. This was her first run for the general public after a 6 year restoration. Description: Clover Valley Lumber Company 4 about to couple to the 2013 Winterail Photographer's Special train. This was her first run for the general public after a 6 year restoration. Description: Clover Valley Lumber Company 4 backing up to prepare for another photo runby for the 2013 Winterail Photographer's Special. This was her first run for the general public after a 6 year restoration. Description: Clover Valley Lumber Company 4 westbound just outside the Brightside yard limit with the 2013 Winterail Photographer's Special. This was her first run for the general public after a 6 year restoration. Description: Clover Valley Lumber Company 4 running around the 2013 Winterail Photographer's Special train at Niles. This was her first run for the general public after a 6 year restoration. Description: Clover Valley Lumber Company 4 puts on a nice smoke show during a photo runby for the 2013 Winterail Photographer's Special. This was her first run for the general public after a 6 year restoration. Description: Clover Valley Lumber Company 4 puts on a nice steam display as she runs around the 2013 Winterail Photographer's Special train at Niles. This was her first run for the general public after a six year restoration. Description: Clover Valley Lumber Company 4 backs up to be out of site for the first runby of the 2013 Winterail Photographer's Special. This was her first run for the general public after a 6 year restoration. Description: Clover Valley Lumber Company 4 performing a photo runby for the 2013 Winterail Photographers Special. This was her first run for the general public after a 6 year restoration. Description: Clover Valley Lumber Company 4 backing up to be out of site for a photo runby. This was her first run for the general public after a 6 year restoration. Description: Clover Valley Lumber Company 4 puts on a nice show for the first photo runby of the 2013 Winterail Photographer's Special. This was her first run for the general public after a 6 year restoration. Description: Amtrak California 2051 with perfect timing passes Clover Valley Lumber Company 4 running around the 2013 Winterail Photographer's Special train at Niles. 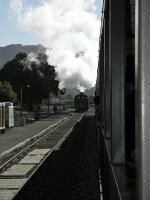 This was the 4's first run for the general public after a 6 year restoration. Description: Clover Valley Lumber Company 4 performing the first photo run by of many during the Logger's Special event for Steamfest 2014. Description: Clover Valley Lumber Company 4 backing up for the first photo run by of the day, with the logging train for the Logger's Special event during Steamfest 2014. Description: Clover Valley Lumber Company 4 backing up for her second photo run by of the day for the Logger's Special event during Steamfest 2014. Description: Clover Valley Lumber Company 4 performing her third photo run by for Logger's Special event during Steamfest 2014. Description: Clover Valley Lumber Company 4 performs her fourth and final run by for the Logger's Special event during Steamfest 2014. Description: Mason County Logging Company 7, Santa Cruz Portland Cement 2, and Clover Valley Lumber Company 4 pose side by side at Alston for the Logger's Special event during Steamfest 2014. Description: Mason County Logging Company 7, Santa Cruz Portland Cement 2 and Clover Valley Lumber Company 4 pose together at the Sunol depot, after partic0ipating in the Logger's Special event for Steamfest 2014. Description: The participants of Steamfest 2014, take a well earned break after completing the quintuple header event, the final railfan/photographers event of Steamfest 2014. Description: Mason County Logging Company 7, Santa Cruz Portland Cement 2, Quincy Railroad 2, Robert Dollar Company 3, and Clover Valley Lumber Company 4 perform a photo run by for the quintuple header event during Steamfest 2014. 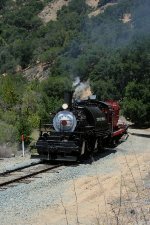 Description: Mason County Logging Company 7, Santa Cruz Portland Cement 2, Quincy Railroad 2, Robert Dollar Company 3, and Clover Valley Lumber Company 4 are about to cross the Mission Boulevard bridge as they head east towards Sunol with the quintuple header train during Steamfest 2014. 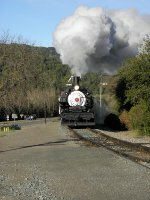 Description: Quincy Railroad 2, Robert Dollar Company 3 and Clover Valley Lumber Company 4 arrive at Sunol with the quintuple header train for the quintuple header event during Steamfest 2014. Mason County Logging Company 7 and Santa Cruz Portland Cement 2 would couple onto the front later. Description: Quincy Railroad 2, Robert Dollar Company 3 and Clover Valley Lumber Company 4 perform a photo run by for the quituple header event during Steamfest 2014. Mason county Logging Company 7 and Santa Cruz Portland Cement were shoving on the rear of this very overpowered train.